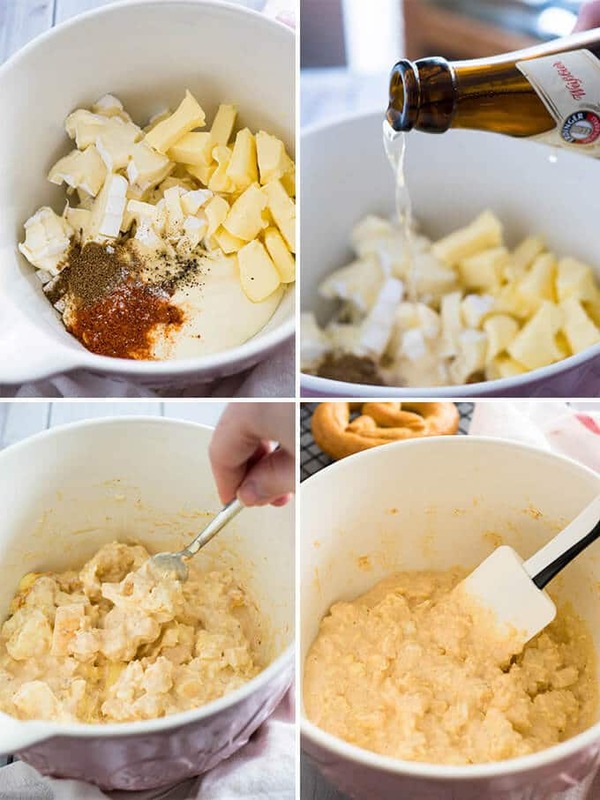 Obatzda, a flavorful German Beer Cheese Dip, is a beer garden classic made with camembert cheese, butter, and beer! This easy cheese dip can be made ahead and makes a delicious appetizer or snack with pretzels or rustic bread. Perfect for your next Oktoberfest party! Obatzda is a classic Bavarian dish that you can get in every beer garden, supermarket in Bavaria, or traditional Bavarian restaurant. But it’s super easy to make at home with ingredients you can get at your local supermarket! This easy recipe is perfect for making ahead. 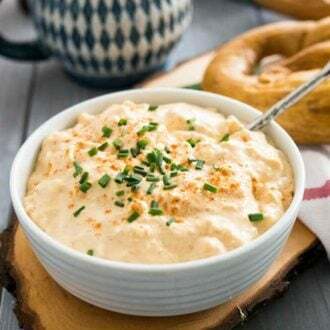 There are many different ways to make this beer cheese spread but one thing they all have in common are the main ingredients: aged soft cheese like Camembert or Brie, good quality butter, and a small amount of wheat beer. 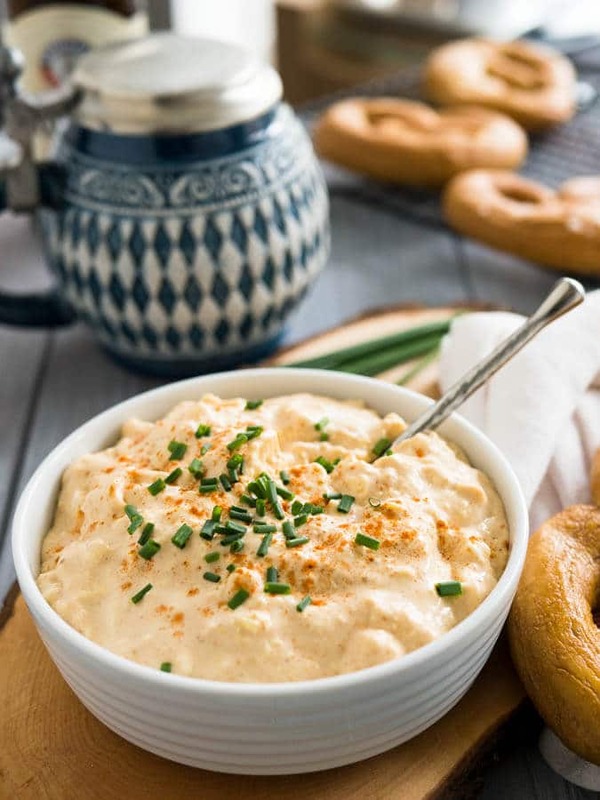 Obatzda or Gerupfter (Franconian name) is traditionally seasoned with paprika, caraway seeds, salt, and pepper. 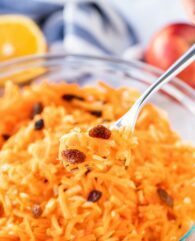 You can add chopped onions to the dip but I recommend adding them just before serving otherwise they could develop a bitter or soapy taste when you make the dip in advance. I’ve tried many different variations of this beer cheese dip and the recipe below is my favorite way to make it! If you can’t have alcohol you can omit the beer or use a non-alcoholic beer. Instead of wheat beer, you can also use any other German beer. Using your hands works best to mix the ingredients together. Take out all the ingredients from the fridge half an hour before starting to make this recipe. Cut the butter into small cubes, it will come faster to room temperature. Using room temperature ingredients makes it easier to mix everything together. to the camembert cheese. A common problem with Obatzda, made only with cheese and butter, is that it gets quite firm in the fridge. Don’t use cream cheese instead of spreadable cheese wedges. The cream cheese flavor is not the right choice for this dip. Add the sliced onions just before serving this way you can store the cheese dip longer. Serve this beer cheese dip with pretzels, pretzel bread, or a rustic sourdough bread. 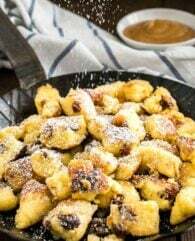 My Bavarian Pretzels are perfect to make with this recipe! This recipe is perfect for your Oktoberfest party but also makes a great addition to every holiday appetizer buffet! 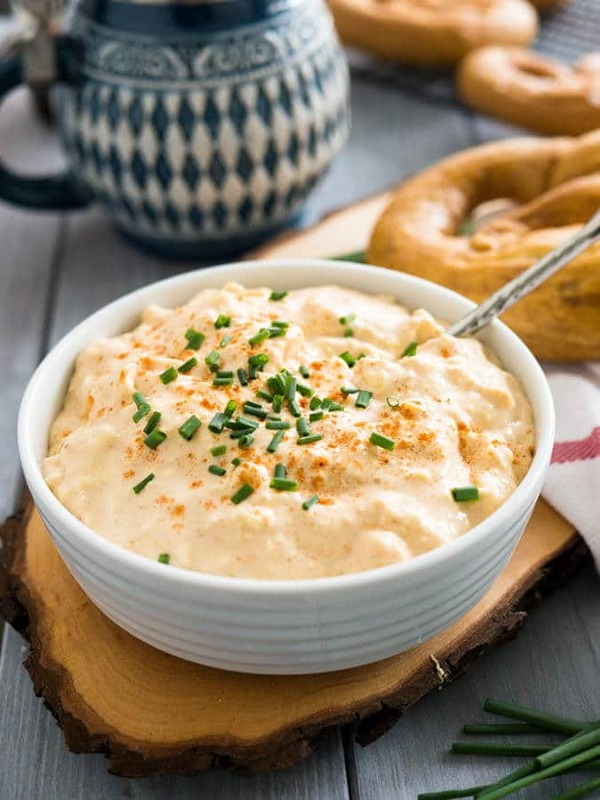 Want to try this German Beer Cheese Dip Recipe? Obatzda, a flavorful German Beer Cheese Spread, is a beer garden classic made with camembert cheese, butter, and beer! This easy cheese dip can be made ahead and makes a delicious appetizer or snack with pretzels or rustic bread. Perfect for your next Oktoberfest party! Cut the Brie (or Camembert) Cheese into small cubes and add it to a medium bowl. Add Laughing cow cheese, butter, wheat beer, ground caraway, ground paprika, salt, and freshly ground pepper and mix with a fork until combined and smooth. Cover airtight and let it sit in the fridge for at least 3 hours or overnight. 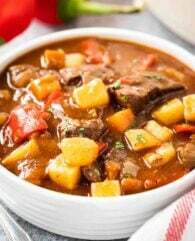 Take it out of the fridge and let come to room temperature before serving. Garnish with chives and finely sliced onion rings. This dip keeps fresh in the fridge for about 3 days (without onions). Made this for a party a few weeks ago and it was a big hit! I served the dip with you pretzel recipe and everyone wanted the recipe. Thank you! I just need that pretzel!